Klarna is one of Europe’s largest banks and is providing payment solutions for 60 million consumers across 100,000 merchants in 14 countries. Klarna offers direct payments, pay after delivery options and installment plans in a smooth one-click purchase experience that lets consumers pay when and how they prefer to. The integration of Klarna with your Spree Commerce store can be done quickly and easily following the guidelines mentioned below. Klarna Checkout is a “one-stop-shop” platform. By providing harmonized presentations of payment and delivery options, coupon collection and up-selling, it lets merchants sell globally with a personalized purchase experience, using only one partner. Simple and secure direct payments. A flexible-friction payment method for instant payments and subscriptions. Pay now offers one-click payments when possible, and dynamically asks for more data when needed to keep the customer safe. Buy now and pay later at your convenience with a few simple steps. Interest-free invoice payments that are locally optimized and globally compliant. Flexible consumer finance that lets customers pay over time. Klarna’s Slice it is a modern installment product that gives your customers the intuitive control and flexibility they need to make spreading the costs of a purchase over time worry and hassle free. Slice it increases purchasing power for your customers, which in turn boosts sales for you. With Klarna comes a brand new order-handling system: the Merchant Portal. You can choose between different apps that brings value to your merchants business such as Merchant Insights, On-site marketing and Boost (Klarna funding). Please note that the version is still 0.9. We want to have the option to make breaking changes during the transition to 1.0. After the installation, create a new payment method and select Spree::Gateway::KlarnaCredit as the gateway. After saving the payment method, you can configure your Klarna credentials and set design options for how Klarna is displayed to the customer in the checkout. The “country” option is mandatory and refers to the region the account is associated with. In the example above it’s us for the USA, other values would be uk for the United Kingdom and de for Germany. There are two other things to configure. Set the payment method to “active” and only enable it in the frontend. Some payment methods can be used in the backend by the merchant. As this is not appropriate for Klarna Payments, it should be disabled. You can also configure to automatically capture the payments when the customer confirms their order. 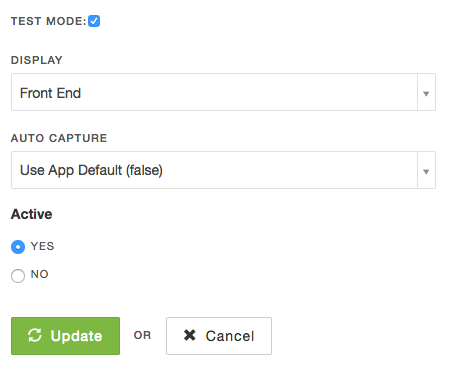 The test mode allows you to test the integration with test data. Disable this option for production use. Note: After you ran klarna_gateway:install the initializer in config/initializers/klarna_gateway.rb allows some configuration. It’s usually not necessary to touch the file unless you’re sure what you’re doing. The template can be overwritten by copying the file to app/views/spree/checkout/payment/_klarna_credit.html.erb in the main application. Note the initialisation JS code which is required for the integration to work. 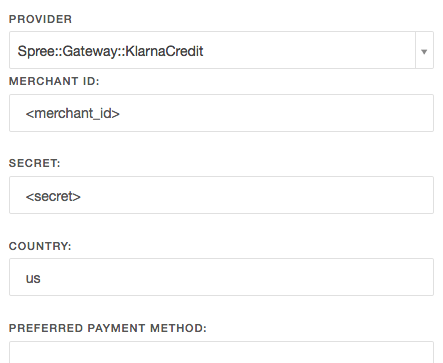 The initialization is done in klarnaAuthorize() on the payment step page in the checkout. It will create a session with Klarna and load the iframe when Klarna is selected by the user. It is called on the container (.klarna_credit_box in this case) in which the iframe will be inserted. // field for the payment source. // the payment can be authorized before progressing any further. // Load the Klarna iframe directly after page load, not only when Klarna was selected. // error or the user did not input required information. // payment methods in the store. // Wraper for the whole payment method. This is being hidden when Klarna returns with `show_form == false`. // side. This should not be changed. // the autorization is issued. For more information see Klarna’s Developers Portal. 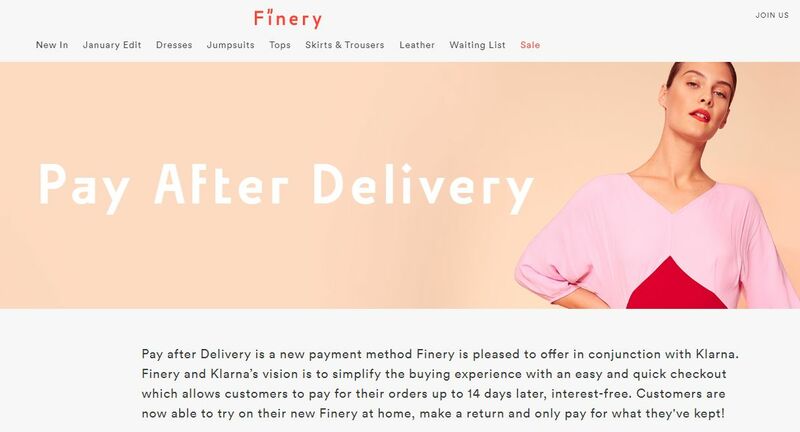 Finery London is an online womenswear brand with a unique point of view and a mission to make modern, inspiring and sophisticated styling accessible, without compromising on quality. The company uses Spree for its modern and elegant eCommerce platform and Klarna for its Pay after Delivery payment method.